We went to see a venue at the beginning of our wedding planing, and I fell in love with it. It was pretty shabby looking from the front, but once you got inside, oh my gosh. You were transported to a beautiful resort. You didn't feel like you were in North Carolina; it felt like some posh resort in Playa del Carmen. Pete and I walked to the beach area where a wedding was already set up and I just started imagining our guests out there with the ocean as our backdrop. We crossed the street (which I was a little bummed about but figured I would just deal) and were greeted by the outdoor dance floor. It was exactly like all the beautiful Pinterest photos I had seen. I just loved it. Pete and I crossed the street again to go back to the tiki bar by the pool and discuss. We loved it ... but had some concerns. 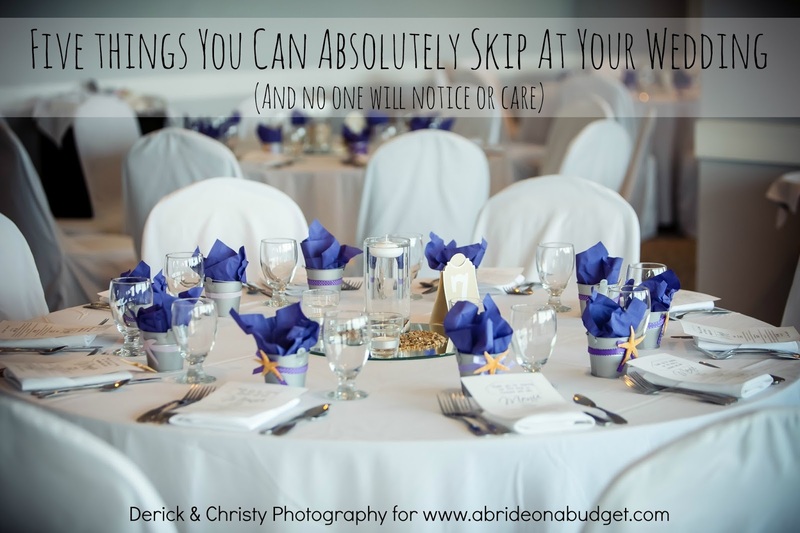 See, with an outdoor wedding, there are a lot of things you need to take into consideration that you don't when you're planning an indoor wedding. But you don't have to think about them. I've already thought about them for you. Plan for a hot day. If you're planning a winter wedding, you're probably not going to have the ceremony outdoors. These types of venues are reserved for the other three seasons. And those other seasons can be hot. Really hot. When I was originally writing this up, it was a regular summer day, and it was nearly 100 degrees. I was sitting at the pool, so once the heat became unbearable, I could jump right in. But your wedding guests won't have that option (although, if I'm being completely honest, two of my bridesmaids jumped in the pool at our wedding. But most wedding guests won't do that). So for an outdoor wedding, you really have to think about what you'll do on a hot day. For the ceremony, you definitely want to order wedding program fans. If it's hot, your guests will most likely be fanning themselves with anything that's handy, and that will most likely be your program. So plan for them and make your programs with handles. 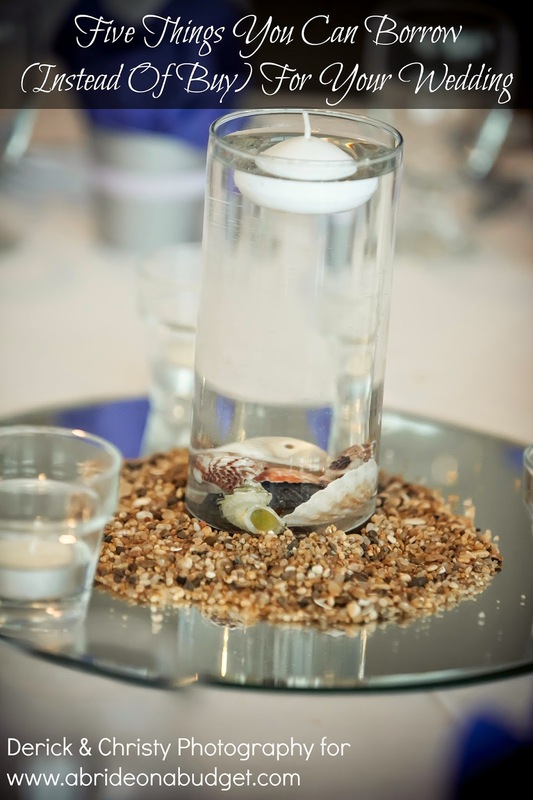 Also, think about how your guests will stay cool during the reception. Is there an AC unit outdoors? Is there an indoor section of the venue where they can cool off? Is the venue's tent equipped with misters that your guests can walk under? The answer to one of these questions has to be yes. If not, you risk our guests getting heat stroke and needing to go to urgent care -- and no one wants an ambulance showing up to their wedding uninvited. Alanis Morissette was convinced that rain on your wedding day was ironic. But actually, it's just a pain in the neck. If you're planning a beach wedding ceremony ... and it rains, you need a back up plan. Where will you get married if there's a storm? Make sure your venue has a back up plan for a ceremony and reception, in case of bad weather. If the ceremony moves into the reception area, where will your guests go during the breakdown and set up? If the venue doesn't have a back up plan (and some don't), you need to find a different one. You also have to ask if the venue will cancel your wedding due to bad weather. We went to a venue that had in its contract that any inclement weather or "acts of God," including hurricanes, could void the contract with no refund. So basically, if a tropical storm rolls through, the venue can call your wedding off and you don't get your money back. In that case, you need wedding insurance (yes that's a thing), but you also need a back up plan. Your guests are still planning to come, so you have to give them somewhere to be. If the venue can't help you come up Plan B, this is not the venue for you. Keep your guests extra hydrated. An open bar is great at a wedding, but if yours is outdoors, there's a good chance your guests will want water too. So make this something special for them. Have the wait staff hand out small water bottles with personalized labels to guests as soon as they enter the reception hall. Print something cute like, "Welcome to our wedding" on them and your guests will love them. At the end of the night, you can have a table with full-size water bottles with a matching label that says, "Thanks for coming." It's a nice way to say "drink some water" without actually shoving it down their throats. Also, make sure water is an available beverage choice. I know, it sounds obvious, but when you choose your own caterer, you often need to hand select every item on your menu, and that includes beverages. If you don't ask for water, you might not get it. Fill the venue with "extras" that your guests may have forgotten. Some of your guests may not actually realize that your ceremony or reception (or both) is entirely outdoors, so they may not plan accordingly. Help them out. Create a sunscreen bar so they don't go home burned. Pick up cooling wipes (they actually work, believe it or not) and have them near your sunscreen basket. Pick up paper fans (if you don't do the program ones) and have them available. 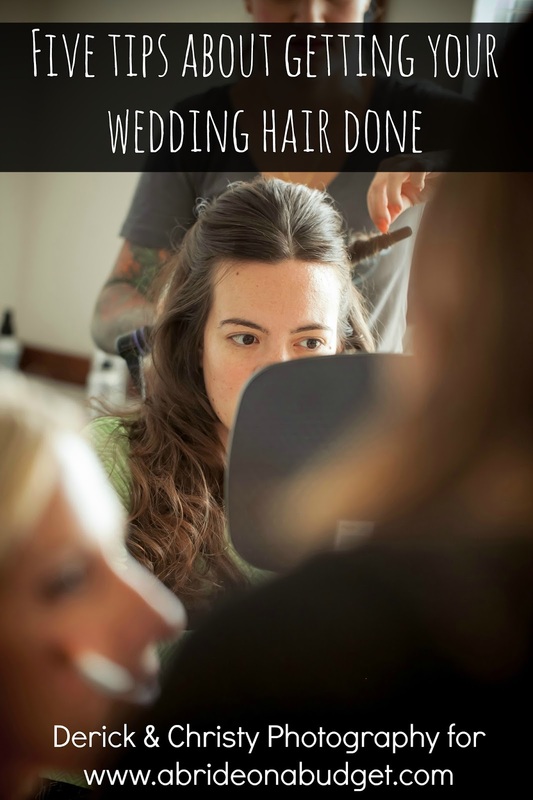 You'll be standing for the majority of your wedding ceremony and the last thing you want to do is pass out before the "I Do." But with all the running around you'll be doing pre-wedding, you won't have time to eat or drink, which aids in your lightheaded-ness. Standing in the sun during the ceremony probably isn't a good idea. So don't. Instead of flowers, hold a really pretty wedding parasol when you walk down the aisle. You can get one in white for you, and your bridesmaids can carry ones that match their dresses. Then, you can hold it open during the ceremony. You'll get more use out of it -- and you'll get a little shade too. Choose your bridal party's attire appropriately. With an outdoor venue, you have to worry about your bridal party. If it's an outdoor wedding in summer, don't force your bridesmaids to wear long, heavy gowns. If it's an outdoor wedding in winter, don't ask your girls to wear open toed shoes (because walking through snow with those is not fun). For the groomsmen, think about just how hot a black tuxedo can get in the sun. Choose a lighter color, like khaki. And maybe do vests instead of a suit jacket. And a lighter shirt will be their friend (because you don't want sweaty pit stains in your photos for the rest of your life). 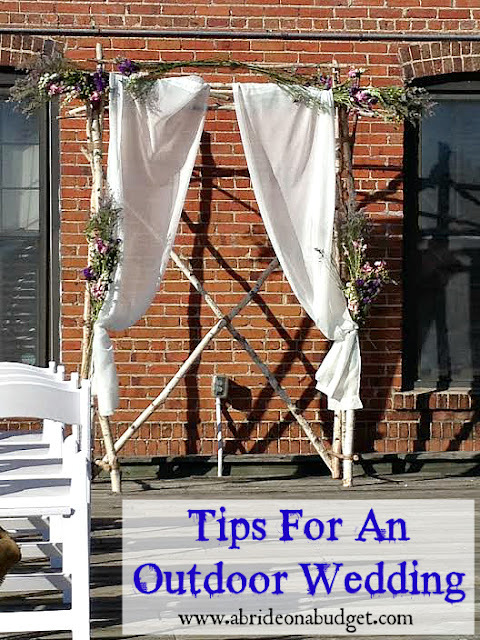 BRIDAL BABBLE: What other outdoor wedding tips do you have? Outdoor weddings are my favorite! Especially the rustic theme weddings, i have spent several hours on pinterest before looking at ideas. Great tips! Thanks for the tips! My daughter is having an outdoor wedding next summer so these will be VERY helpful.